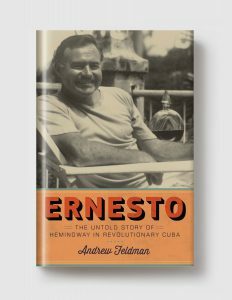 In Ernesto, Andrew Feldman uses his unprecedented access to newly available archives to tell the full story of Hemingway’s self-professed Cuban-ness: his respect for Cojímar fishermen, his long-running affair with a Cuban lover, the warmth of his adoptive Cuban family, the strong influences on his work by Cuban writers, his connections to Cuban political figures and celebrities, his denunciation of American imperial ambitions, and his enthusiastic role in the revolution. With a focus on the island’s violent political upheavals and tensions that pulled Hemingway between his birthplace and his adopted country, Feldman offers a new angle on our most influential literary figure. Far from being a post-success, pre-suicide exile, Hemingway’s decades in Cuba were the richest and most dramatic of his life, and a surprising instance in which the famous American bully sought redemption through his loyalty to the underdog. ANDREW FELDMAN spent two years conducting research in residence at the Hemingway Museum and Library in Havana, Cuba. He has taught at Tulane University, Dillard University, and the University of Maryland. He lives with his wife in New Orleans, Louisiana.